I’m currently reliving Robin Hobb’s Liveship Traders trilogy during my commute to and from work in the car. (Have I mentioned how much I love audiobooks?) I first read this amazing fantasy trilogy back in 2005 and it has since resided firmly near the top of my all-time favourite novels/series. Even so, I’ve previously read the trilogy only the once. Reliving it again now is a delicious treat – so much so that I find myself deliberately opting for peak hour, just so I can drive in the worst traffic and have 10 minutes longer each morning and evening with this brilliant story. 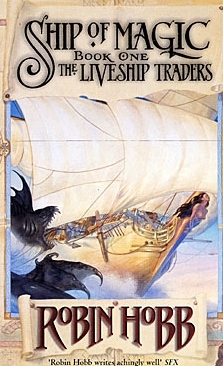 The Liveship Traders tells the story of the Vestrit Trader family, whose fortunes are derived from trade conducted by their liveship, Vivacia – a ship built of wizardwood, whose animated figurehead holds generations of family knowledge – and their struggle for survival in a world that is rapidly changing. Unlike most ‘epic’ fantasy novels, the books do not have a single ‘all-powerful’ antagonist. Rather, the story relies on the life-and-death struggle of a cast of well-drawn and disparate (and desperate) characters in conflict with each other. Some characters are more sympathetic to the reader than others, but even the ‘nice’ ones are supremely flawed. All are filled with conviction, and each character’s individual story is compelling and believable. Each acts according to his/her nature and the resulting events reflect cascading collisions of motive and desire. Althea Vestrit – Upon her father’s death, Althea learns that her beloved ship has been bequeathed to her sister and detested brother-in-law (Kyle Haven), who throws her off the ship. She vows to recover Vivacia through proving herself as a sailor and out manoeuvring Kyle. Wintrow Vestrit – The son of Kyle Haven in training to become a priest, Wintrow is dragged from his chosen life by his father and forced to live aboard Vivacia and become a sailor. He battles his father’s dominance over him, while reluctantly coming to love Vivacia. Ronica Vestrit – Mother of Althea and the business brain behind the family, Ronica needs Vivacia to be profitable to prevent an ancient family vow from committing her granddaughter in marriage to pay the liveship debt. Captain Kennit – A notorious pirate, Kennit longs to be crowned king of the pirates and sail in his own liveship. Vivacia becomes his target. Kyle Haven – Married to and ‘responsible’ for the Vestrit family, Kyle believes it is his role to save the family from ruin. (Kyle is the least sympathetic of all characters, and undoubtedly plays the role of ‘the villain’ in this first book for both Althea and Wintrow.) He attempts to turn the family fortunes around by using Vivacia to traffic in slaves. Brashen Trell – Disowned by his Trader family, Brashen is struggling to ‘make a new life’ as a common sailor and dispel the taint of his youthful indiscretions. He alone of the major characters has no vested interest in Vivacia; his story is entwined with Althea’s, as he provides unconditional friendship, love and support for her. Thus is Vivacia the bone of contention in Ship of Magic: loved and desired by Althea, resented and reluctantly loved by Wintrow, used and abused by Kyle; coveted and ultimately captured by Kennit; the vessel of hope for Ronica. The symbol of life thus becomes the object that threatens to tear apart the lives of these characters. As a writer, I learnt a lot about character and conflict through reading this series. I love (and am in awe of) the way Hobb sets up a large cast of characters, gives each of them such strong, believable goals and then pits one character up against another. Because they have directly conflicting desires, each sees the other as an antagonist. Even Kyle (whom I detest) – misguided, foolish and cruel – believes he is acting in the best interests of his family. Even more impressive to me is the way Hobb escalates the story through the trilogy and broadens her focus to reveal just how trivial the battle for Vivacia really is. But the best thing about this series (and Hobb’s writing in general) is the way she makes me feel when I’m reading. I laugh, I hate, I love, I cry when I’m reading these books. Her characters are among the best I’ve ever encountered. Which books have affected you most powerfully? Fellow writers: What’s the best writing lesson you’ve learnt from reading? I’m sold! I’m going to have to read this series. (My to-read list is getting insane. Recently, I read “The Hunger Games,” which i was surprised by. I couldn’t put that one down. Very compelling. Suzanne Collins certainly has a knack for keeping the reader “in the moment” with the characters – something I could learn a lot from! I hope you love it as much as I do! Thanks for inclusion in your mash up. I haven’t read the hunger games yet. One day… Although my TBR list is very long! I made the mistake of reading Robin Hobb’s Shaman’s Crossing (book 1 of the Soldier Son trilogy) as the first piece of her work I ever read, and thought it was awful. I couldn’t see what all the fuss was about if that was a good representation of her work. But then a couple of months ago, I was in the local library and found The Dragon Keeper, and decided to give her a second try, because I couldn’t reconcile the praise she gets with the quality of Shaman’s Crossing – there had to be something I was missing. I am so glad I did, because I loved it. It’s about the liveships too, which I think are brilliant, and I am waiting for the second part of the Rain Wilds Chronicles to be returned to the library so I can read it. But I was so converted by The Dragon Keeper that I went and bought the entire Farseer trilogy recently. I haven’t read any of them yet (the list of books I own and need to read is quite a long one), but I’m looking forward to them after how brilliant The Dragon Keeper turned out to be. I was introduced to Robin Hobb by a colleague many years ago, and have read her voraciously ever since – and adore the Farseer / Liveship / Rain Wild books. I too put Shaman’s Crossing down the first time I picked it up, but then ended up getting the audio and actually really enjoyed the series in the end, although it was very slow to start. I thought I introduced them to you (lol)! Garrad introduced me to the Farseer Trilogy but you helped me see that she is much more than that! There are so many books out there that I love that it’s hard to choose! Most recently I am way in love with Melina Marchetta’s On the Jellicoe Road. That book is brilliant. I also LOOOOOVE audio books. Listen to ’em all the time. Right now, I’m finishing up Libba Bray’s Beauty Queens which is hands down the most awesome audio book to listen to. Highly recommend it. Libba reads it and does all the voices. She is such a witty writer. Love her, too. Will have to check both those out! HI Ellen, i only stumbled across Robin Hobb’s books at the local library, when i was back living in Aus. and LOVED them. 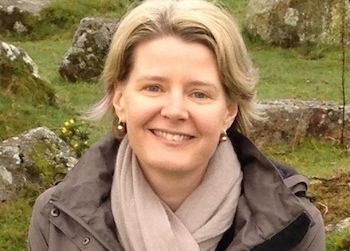 my previous favourite fantasy series writer was katherine kerr, and when her deverry series ended i was looking for something…. and indeed, i love the series. haven’t read them all yet. i love the way the ships are characters, and i loved the whole sequence of the dragon babies moving upriver to the mysterious rumoured old city. all the characters are so believable – i really like the way you have described above the individual characters with their antagonisms. another fantasy writer i stumbled into in the local library was Daniel Fox’s Jade Man’s Skin – brilliant, riveting reading, with beautiful prose. i wanted to find more in his sequels but could not find them in bookshops nor libraries. i guess there is always amazon. and of course there is kylie chan – her fast paced action fantasy is a reminder to me that these days, publishers and public seem to want fast pace and faster pace… i love Robin Hobb because there is so much character in the plot, it just is riveting. Yes, Robin Hobb is mostly about the characters for me — but the grand vision of the liveship trilogy is also magnificent. These books have a great balance of deep characterisation and pace I think. I haven’t heard of Daniel Fox, but I have read some of Kylie Chan’s books. I loved the first trilogy (starting with White Tiger), but haven’t read past those first three. The contemporary Hong Kong setting with demons and gods is a LOT of fun! Why do you forget the character of vivacia herself In this piece? Vivacia and her struggle to find herself through and outside of her human and dragon families is a major aspect of the conflict in this trilogy. I guess you’re right, although I hadn’t considered it like that before. I don’t think Vivacia has a lot of agency, though — some, but not a lot. Thanks for providing more food for thought. HI Ellen, whats amazing to me is that you didnt consider Vicacia as a character before. The thing about the liveships is that they DO have consciousness, of some sort, and thus do become characters in the story. This is one of the many incredible things about the world that Robin Hobb has created – unique concepts which are so well integrated into a storyline which is so well written we, the readers, are just in there, with all of them, good and bad….. a Ship with concsiousness ? A Ship built from living wood which once was a baby dragon that didnt have enough sustenance to grow? Incredible! Just as the people, all the Liveships have differing types of characters….. I also, after discovering Hobb a few years back via the liveships and the Rain Wilds, took our the Shamans Crossing from the library and just coulndt get into it at all. I did however read her 2014 book Fool’s Assassin and happened to be online a couple of months ago when the sequel Fools Quest came out. I resisted the temptation to buy it straight away on kindle so I can look forward to buying a real book when Im home in Aus at xmas! she’s not the same depth as the humans because she is a ship made of wood containing baby dragons which couldnt come to life! by her very nature she is not as dimensional as the humans as the ship becomes ‘live’ because of dragonhood being thwarted and not maturing. thus, i consider she has drawn them very well, characterised them as true to the nature of what they are. but everyone has their favourite characters, dont they? i think i was first introduced to the Ships via the Mad Ship – whose name i have forgotten – and that Ship’s character was very well drawn as he was mad! um, yeah, I realise that. They are what they are. And done very well. (You are thinking of Paragon.) But at the end of the day, both Vivacia and Paragon are part of the supporting cast. They affect outcomes, but don’t drive them. This is not a criticism. I’m just saying I didn’t originally discuss them in the post, because I was discussing those characters who were driving events in the first book (Ship of Magic) by squabbling over Vivacia.